I just bought and installed the new 3121e speed frames from Miller Sports. I do not work for nor represent Miller Sports in any way. I am the skater in the street. 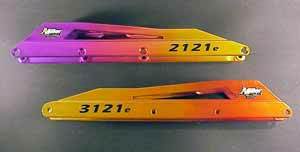 Miller has introduced two new speed frames: the 2121e (see separate review) and 3121e. Both of these frames depart from the traditional Mogema Diamond five-wheel design in many ways. What I have noticed so far is that they are faster. I am trying to figure out why a stationary hunk of metal is so swift. My impressions are they are lighter because they use only four wheels, thus eliminating the weight of a road wheel, spacer, axle and two bearings. The remaining four wheels are asymmetrically placed; the two center wheels are close together, the rear wheel is behind the boot mount and the front wheel is way out there in front making it as long as a 12.8" five-wheel frame. The wheel spacing positions the wheels under your power stroke area giving you a greater road contact push where you need it most--arch and heel. Moreover, these frames feature precision-milled rounded bearing mountings so they can also accept the new, speedy Mini bearings. The 3121e frames have a little lower front end than the 2121e, allowing better body positining for track racing, "pre-loading," as Miller proclaims. Both frames accept up to an 80mm wheel. Miller supplies spacer washers (shims) to raise the frame up a bit for added clearance for some non-Miller boots. Because the wheels are between the boot's mounting blocks, flat frame bolts do not apply. Miller does acknowledge that using the shims somewhat negates the advantages of the new frame design, and thus they recommend the 2121e. If either of the two frames are too low, my suggestion is that instead of using the supplied shims, check out Wedgies. Wedgies will not only raise your boot off the frame a slight bit for the added wheel clearance, they will also keep you on your outer edges better. Another solution, of course, is to use smaller wheels. Be aware that there are boots these frames simply won't fit. Boo-hoo! Performance wise, these are slippery fast. Because they are so light and much lower, they are easy to handle (fast, happy feet). Eliminating the second wheel not only allows the lower frame design, it also eliminates a percentage of wheel scrubbing, or friction while turning. This results in less wheel-grab to force through a turn, allowing increased foot speed. In other words, they turn very fast with little effort. I noticed this more than many skaters would because I have been using a very long 13.5 five-wheel frame for the past half year! The triple-tier bracing makes the frame strong so you can really dig in: efficient thrust. Skiers would understand a reference between the difference of straight skis and the new parabolic shapes with the 2121e and the 3121e being the new shapes. Zippy! 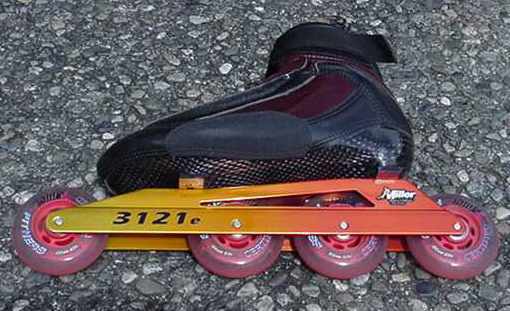 But what I noticed on my real-world 30-mile inaugural outdoor skate with the 3121e frames was just how fast and maneuverable they are. All through my skate I was impressed with how quick they responded to technique. Actually, it took me a while to get used to how responsive they are. I appreciated the lighter weight on long hauls. The downside? Missing one wheel, I noticed that going over manhole covers, rail crossings, grates etc., is more noticeable and I had to compensate for an unexpected deceleration that five-wheelers typically smooth over. Another is high speed downhills; I am cautious here because of their increased maneuverability. The Millers may not be the frame for this (at least for me). But on smoother, flatter surfaces, they seem invisible and are "the" frame for track skating. The controlled surface of an indoor rink is another story. I first noticed how quickly these frames took to the turns. Because they are lower, they give you more control in the corners. It became easier to push out with my heel through a fast series of crossovers--easier to find my heel in the turns. I must add that I put in two 78a wheels between the two 83a wheels for extra grip. I became much more confident running through crossovers, all with less boot scrub. Backward crossovers were easier and faster which again took some getting used to, which has nothing to do with racing, but helps illustrates their ease of use. Rolling from edge to edge was very easy (you could almost play hockey in them), making the double-push more accessible. Imagine being used to lifting a fifty-pound weight and getting pretty good at it. Then someone hands you a twenty-pound weight: You just about throw it through the ceiling. These frames are like that, so you'll do a bit of adjusting, but all the power comes through. From a vanity point of view, these frames are gorgeous and flashy to look at. They turned the heads of every skater I met (beginner and advanced alike), and they look fast just sitting there. They look like "Frames from the future." It's important to note that these frames aren't for beginners. But then, beginners are in recreational boots anyway, which don't support removable frames, so that's a moot point. The Miller frames are designed for advanced and pro/elite skaters, but I think any earnest fitness skater would appreciate them. It is my bet we may see these new designs at the Olympics when skating becomes part of the events. Time will quickly tell if they are truly time-shavers. In conclusion, I am not going to toss out my trusty Mogema five-wheelers, but rather add these Miller frames to my arsenal for wicked attacks. The 3121e speed frames look like a winner for indoors as well as outdoors with twisting courses. All in all, I feel they are an advancement in skate frame technology rather than simply a novelty with "wow" graphics. They are low, light and fast. The only thing I don't like about them is taking them off my feet at the end of a roll! All content accessed through the Get Rolling Web Site is copyright © by Get Rolling. The Get Rolling name is a registered trademark ® of Get Rolling.